一种药物组合物，其含有非典型抗精神病药物和琥珀酸、富马酸或琥珀酸和富马酸的混合物。 A pharmaceutical composition comprising an atypical antipsychotic drug and a mixture of succinic acid, fumaric acid or succinic acid and fumaric acid. 本发明涉及一种稳定的药物组合物，其含有非典型抗精神病药物和至少一种选自琥拍酸(succinic acid)、富马酸(fumaric acid)或其混合物的有机酸。  The present invention relates to a stable pharmaceutical composition comprising an atypical antipsychotic drug and at least one selected from succinic acid Sign (succinic acid), fumaric acid (fumaric acid) or a mixture of an organic acid. 特别地，本发明涉及一种药物组合物，其含有二氮杂卓、氧氮杂卓或硫氮杂卓非典型抗精神病药物和至少一种选自琥珀酸、富马酸或其混合物的有机酸。 In particular, the present invention relates to a pharmaceutical composition comprising a diazepine, oxazepine thiazepine or organic atypical antipsychotic drug and at least one selected from succinic acid, fumaric acid or mixtures thereof acid. 当在大约25°C，将所述组合物置于充足的水中以生成以重量体积百分比计，I %的溶液或混悬液时，所述组合物应显示PH在5以下，优选在4以下。 When at about 25 ° C, the composition when placed in water to generate sufficient weight to volume percentage, I% solution or suspension, the composition should show PH 5 or less, preferably 4 or less. 非典型抗精神病药物是一类用于治疗精神疾病，例如精神分裂症(schizophrenia)、急性躁狂症(acute mania)和双相障碍(bipolar disorder)的药物。  The atypical antipsychotics are a class for the treatment of mental disorders such as schizophrenia (Schizophrenia), acute mania (acute mania), and bipolar disorder drugs (bipolar disorder) is. 某些早期的或典型的抗精神病药显示出大量的不良副作用，例如急性动作障碍(acutedyskinesias)、急性肌张力障碍(acutedystonias)、不自主动作(motor restlessness)、假性帕金森症(pseudo-Parkinsonism)和迟发型运动障碍(tardivedyskinesias)。 Some of the early or typical antipsychotics show a large number of adverse side effects, such as acute movement disorders (acutedyskinesias), acute dystonia (acutedystonias), involuntary movements (motor restlessness), pseudo-Parkinson's disease (pseudo-Parkinsonism ) and tardive dyskinesia (tardivedyskinesias). 这些不利的副作用已经被称为锥体外系症状(extrapyramidal symptoms)。 These adverse side-effects have been known as extrapyramidal symptoms (extrapyramidal symptoms). 为了克服这些锥体外系症状，开发了一组通常被称为非典型抗精神病药物的化合物。  To overcome these extrapyramidal symptoms, developed a group of compounds generally referred to as atypical antipsychotics. 这些非典型抗精神病药物通常是影响5-羟色胺和多巴胺受体的杂环化合物。 These atypical antipsychotics are generally heterocyclic compounds affect the serotonin and dopamine receptors. 一些非典型抗精神病药物的例子包括氯氮平(clozapine)、奥氮平(olanzapine)、利培酮(risperidone)、喹硫平(quetiapine)、齐拉西酮(ziprasidone)、帕潘立酮(paliperidone)、阿立哌唑(aripiprazole)、阿塞那平(asenapine)、伊潘立酮(iloperidone)、舍吲哚(sertindole)、佐替平(zotepine)、阿米舒必利(amisulpride)毕菲鲁诺克斯(bifeprunox)、美哌隆(melperone)和其药学上可接受的盐。 Some examples of atypical antipsychotics includes clozapine (clozapine), olanzapine (olanzapine), risperidone (risperidone), quetiapine (quetiapine), ziprasidone (ziprasidone), paliperidone ( paliperidone), aripiprazole (aripiprazole), asenapine (asenapine), iloperidone (iloperidone), sertindole (sertindole), zotepine (zotepine), amisulpride (amisulpride) Bi Feilu Knox (bifeprunox), melperone (melperone) and pharmaceutically acceptable salts thereof. 已经有文献描述了含有非典型抗精神病药物的药物剂型。  have been described in the literature pharmaceutical dosage form comprising an atypical antipsychotic. 例如，Physicians ' Desk Reference, © 2007 ( " PDR ")的第61 版描述了市售的RISPERDAL®产品，其为含有利培酮的口服溶液、片剂、口服崩解片剂和含微球体的注射液(见roR，1676-1688页)；ABILIFY®产品，其为含阿立哌唑的口服溶液、片剂和口服崩解片剂(见TOR，2450-2455页)和GEODON®胶囊和注射剂。 E.g., Physicians' Desk Reference, © 2007 ( "PDR") No. 61 describes the commercially available version RISPERDAL® products, which is an oral solution risperidone, tablets, orally disintegrating tablets containing microspheres injection (see ROR, pages 1676-1688); ABILIFY® product, which is an oral solution containing the aripiprazole, tablets and orally disintegrating tablets (see TOR, 2450-2455 pages) and capsules and injections GEODON® . 一些这类制剂应用了有机酸，例如柠檬酸、酒石酸和苯甲酸。 Some applications of such formulations organic acids, such as citric acid, tartaric acid and benzoic acid. 美国专利号5，563，134公开了含有除酸剂例如抗坏血酸的氯氮平剂型。  U.S. Patent No. 5,563,134 discloses a dosage form comprising an acid clozapine agent such as ascorbic acid. 已报道抗坏血酸能降低粒细胞减少或粒细胞缺乏症(已知其发生在氯氮平给药中)。 Ascorbic acid has been reported to reduce neutropenia or agranulocytosis (clozapine is known to occur in the administration). 美国专利号6，251，895公开了含有苯甲酸的奥氮平剂型。 U.S. Patent No. 6,251,895 discloses a dosage form containing olanzapine acid. 奥氮平还以商品名ZYPREXA®市售，其为应用酒石酸的肌肉注射制剂。 Olanzapine also commercially available under the tradename ZYPREXA® which intramuscular application formulations tartaric acid. 美国专利号5，948，437公开了大量喹硫平剂型，并指出有机酸或有机酸的碱金属盐可以在剂型中用作PH调节剂。  U.S. Patent No. 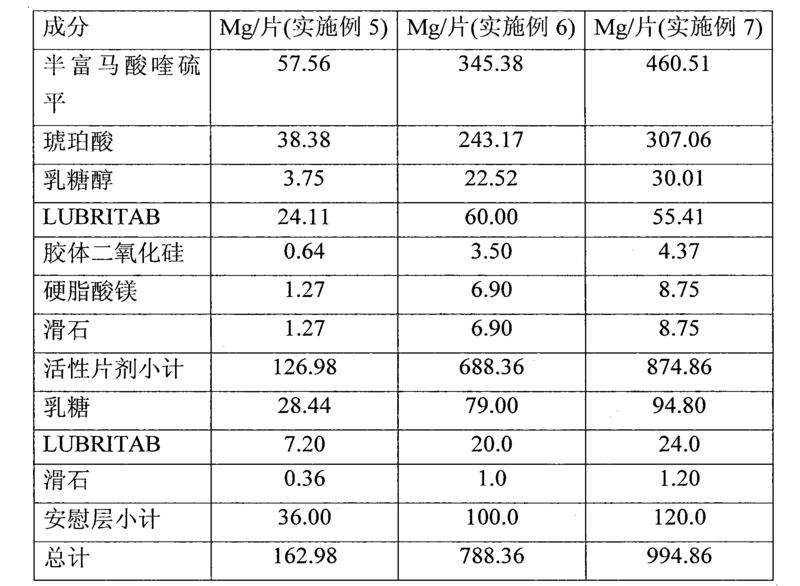 5,948,437 discloses a large dosage of quetiapine, and indicates an organic acid alkali metal salt or an organic acid may be used as PH adjusting agent in the dosage form. 虽然该专利公开了大量有机酸，但是其报道碱金属盐例如柠檬酸钠是优选。 Although this patent discloses a number of organic acids, alkali metal salts such reports but is preferably sodium citrate. 虽然本领域已经描述了许多含有非典型抗精神病药物的药物剂型，但是本发明的目的是提供一种药物组合物，其含有非典型抗精神病药物和选自琥珀酸、富马酸或其混合物的有机酸。  While the art has described a number of pharmaceutical dosage forms containing atypical antipsychotics, but the object of the present invention is to provide a pharmaceutical composition comprising an atypical antipsychotic drug selected from succinic acid, fumaric acid, or organic mixtures thereof. 人们相信这些非金属、双羧酸有机酸的使用提高非典型抗精神病药物的稳定性。 It is believed that these non-metallic, organic dicarboxylic acid used to improve the stability of the atypical antipsychotics. 本发明的另一个目的是提供一种药物剂型，其含有非典型抗精神病药物和选自琥珀酸、富马酸或其混合物的有机酸，该药物剂型可以口服给药。  Another object of the present invention is to provide a pharmaceutical dosage form comprising an atypical antipsychotic drug selected from succinic acid, fumaric acid or mixtures thereof, the pharmaceutical dosage form can be administered orally. 本发明还有另一个目的是提供一种控释的药物剂型，其含有非典型抗精神病药物和选自琥珀酸、富马酸或其混合物的有机酸。 Still another object of the  present invention to provide a controlled release pharmaceutical dosage form comprising an atypical antipsychotic drug selected from succinic acid, fumaric acid or mixtures thereof. 本发明进一步的目的是提供一种控释的药物剂型，其含有非典型抗精神病药物和选自琥珀酸、富马酸或其混合物的有机酸，该控释的药物剂型不含任何膨胀或水凝胶聚合物。 A further object of the  present invention to provide a controlled release pharmaceutical dosage form comprising an atypical antipsychotic drug selected from succinic acid, fumaric acid or mixtures thereof, the controlled release pharmaceutical dosage form does not contain any or expanded hydrogel polymer. 综观随后的说明书，本发明的这些和其他目的将变得显而易见。  Looking at the following description, these and other objects of the present invention will become apparent. 本发明通过提供新型药物组合物，其含有非典型抗精神病药物和选自琥珀酸、富马酸或其混合物的有机酸，来达到上述目的和其他目的。  The present invention provides novel pharmaceutical compositions, comprising an atypical antipsychotic drug and an organic acid selected from succinic acid, fumaric acid or mixtures thereof, to achieve the above objects and other objects. 当在25°C制备以重量体积百分比计I %的水溶液或混悬液时，上述组合物应显示PH在5以下，优选在4以下。 When prepared at 25 ° C in a weight percentage I% by volume aqueous solution or suspension of the composition should show PH 5 or less, preferably 4 or less. 在本发明的一个具体实施方案中，琥珀酸、富马酸或其混合物应为所述组合物的至少大约5重量％，优选为所述组合物的至少大约10重量％，最优选为所述组合物的至少大约20重量％。  In one particular embodiment of the present invention, succinic acid, fumaric acid or a mixture of the composition should be at least about 5% by weight, of the composition preferably at least about 10% by weight, most preferably the composition is at least about 20% by weight. 所述组合物可以是中间组合物或最终制剂或剂型。 The  composition may be an intermediate composition or a final formulation or dosage form. 所述组合物还应含有至少一种附加的药物赋形剂。 The composition also comprises at least one additional pharmaceutical excipient. 本发明的一个具体实施方案为固体组合物。  A particular embodiment of the present invention is a solid composition. 在本发明可选择的具体实施方案中，所述组合物为控释制剂，其含有非典型抗精神病药物、选自琥珀酸、富马酸或其混合物的有机酸和速率控制赋形剂。  In particular embodiments of the present invention an alternative embodiment, the composition is a controlled release formulation, comprising an atypical antipsychotic, selected from succinic acid, fumaric acid or mixtures of organic acids and a rate controlling excipient agents. 所述速率控制赋形剂可以是薄膜形成聚合物(其在所述制剂周围形成包衣或屏障)或骨架(matrix)形成材料。 The rate controlling excipient may be a film-forming polymer (which is formed around the barrier coating or formulation) or backbone (Matrix) forming material. 所述控释制剂的进一步具体实施方案含有非典型抗精神病药物、选自琥珀酸、富马酸或其混合物的有机酸和疏水骨架材料，即非膨胀和/或非凝胶化骨架材料。 The controlled release formulation comprising a further particular embodiment of the atypical antipsychotic, selected from succinic acid, fumaric acid, an organic acid and a hydrophobic matrix material or mixtures thereof, i.e. non-expanded and / or non-gelling matrix material. 本发明涉及一种稳定的药物组合物，其含有非典型抗精神病药物和选自琥珀酸、富马酸或其混合物的有机酸。  The present invention relates to a stable pharmaceutical composition comprising an atypical antipsychotic drug selected from succinic acid, fumaric acid or mixtures thereof. 可用于本发明的非典型抗精神病药物的例子包括氯氮平、奥氮平、利培酮、喹硫平、齐拉西酮、帕潘立酮、阿立哌唑、阿塞那平、伊潘立酮、舍吲哚、佐替平、阿米舒必利毕菲鲁诺克斯、美哌隆和前述药物的药学上可接受的盐、同分异构体和代谢物。 Examples of atypical antipsychotics may be used in the present invention include clozapine, olanzapine, risperidone, quetiapine, ziprasidone, paliperidone, aripiprazole, asenapine, Iraq domperidone, sertindole, zotepine, amisulpride Bi Feilu Knox, pharmaceutically melperone and the pharmaceutical acceptable salts, isomers and metabolites. 在Remington:The Science and Practice of Pharmacy,第20 版和美国药典29 中可以发现更完整的非典型抗精神病药物的名单，这两篇文献以引用方式并入本文。 In Remington: The Science and Practice of Pharmacy, 20th Edition and the United States Pharmacopeia 29 can be found in more complete list of atypical antipsychotics, both of which are incorporated by reference herein. 用于本发明的非典型抗精神病药物的优选组包括二氮杂卓、氧氮杂卓和硫氮杂卓和其药学上可接受的盐。  A preferred group of atypical antipsychotics useful in the present invention include diazepine, oxazepine and thiazepine and its pharmaceutically acceptable salts. 用于本发明的非典型抗精神病药物的更优选组是在美国专利号，229,382 ;5，627，178 ;6，251，895和4，879，288 (以引用方式并入本文)中描述的奥氮平和喹硫平。 More preferred group of atypical antipsychotics useful in the present invention are in U.S. Patent No., 229,382; 5,627,178; 6,251,895 and 4,879,288 are (herein incorporated by reference) describes olanzapine and quetiapine. 最优选的非典型抗精神病药物为喹硫平的药学上可接受的盐，例如富马酸和盐酸盐。 The most preferred atypical antipsychotics as the quetiapine pharmaceutically acceptable salt thereof, for example the hydrochloride and fumarate. 在依据本发明制备的剂型中应用的抗精神病药的量可以在0.25mg至500mg的范围内。  antipsychotic amount applied in the dosage form prepared according to the present invention may be in the range of 0.25mg to 500mg in. 在最终剂型中的量取决于选择的非典型抗精神病药物和含有药物的剂型。 In the final dosage form the amount depends on the choice of the atypical antipsychotics and pharmaceutical dosage forms. 基于已报道的已知抗精神病药物的治疗量决定非典型抗精神病药物的合适量属于本领域普通技术。 Determine the appropriate amount of atypical antipsychotics has been reported based on the amount of treatment known antipsychotic drugs belong to one of ordinary skill. 本发明还含有选自琥珀酸、富马酸或其混合物的有机酸。  The present invention further comprises an organic acid selected from succinic acid, fumaric acid or mixtures thereof. 琥珀酸还被称为琥珀酸(amber acid)、乙烯玻拍酸(ethylenesuccinic acid)和1,4-丁二酸。 Also referred succinic acid (amber acid), ethylene acid shot glass (ethylenesuccinic acid) and 1,4-acid. 通过马来酸或富马酸的氢化或通过琥珀腈的碱或酸水解可以制备琥珀酸。 Or succinic acid can be prepared by base or acid hydrolysis of succinonitrile by the hydrogenation of maleic acid or fumaric acid. 默克索引(Merck Index)报道I克琥珀酸可以溶解于13ml的冷水和Iml的沸水中。 The Merck Index (Merck Index) report I gram of succinic acid can be dissolved in 13ml of boiling water and cold water in Iml. 美国食品和药物管理局(FDA)已确认当以少量用作食品添加剂时，琥珀酸为GRAS(通常被认为安全)化合物。 U.S. Food and Drug Administration (FDA) has confirmed that when a small amount as a food additive, succinic acid GRAS (generally regarded safe) compounds. 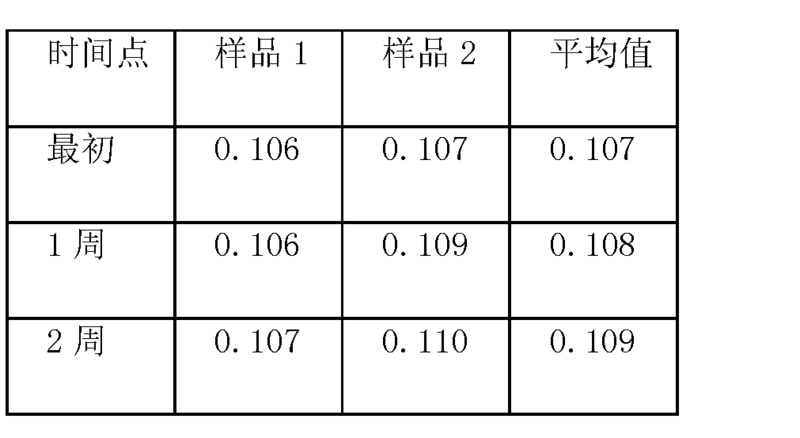 例如21C.FR§ 184.1091确认琥珀酸为增味剂和pH控制剂。 E.g. 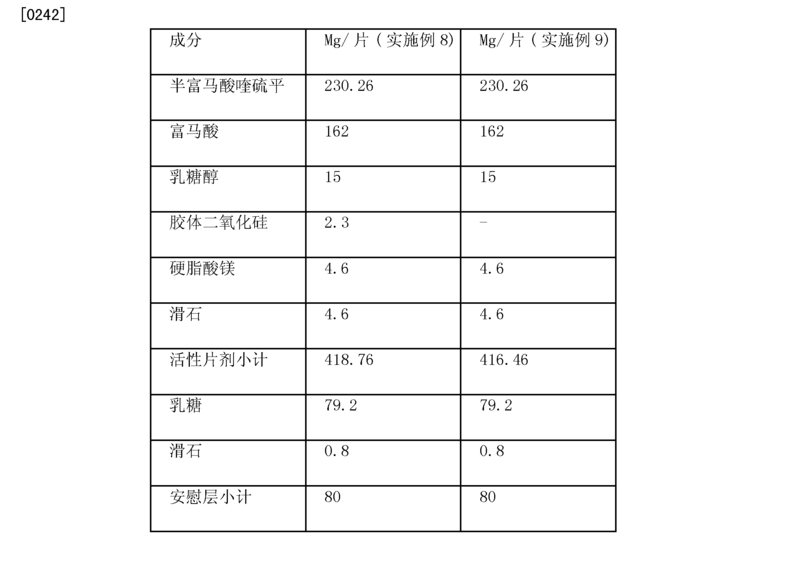 21C.FR§ 184.1091 confirmed succinic acid flavoring agents and pH control agents. 富马酸还被称为(E)-丁烯二酸((E)-butenedioic acid)、反式-1, 2-乙烯二羧酸(trans-1, 2-ethylenedicarboxylic acid)、2_ 丁烯二酸(2_butenedioicacid)、别马来酸(allomaleic acid)、别失水苹果酸(boletic acid)、地衣酸(lichenic acid)和反式丁烯二酸(trans-butenedioic acid)。  fumaric acid also referred to (E) - butenedioate ((E) -butenedioic acid), trans-1, 2-ethylene dicarboxylic acid (trans-1, 2-ethylenedicarboxylic acid), 2_ maleic acid (2_butenedioicacid), maleic acid do not (allomaleic acid), other water loss malic acid (boletic acid), lichen acid (lichenic acid) and fumaric acid (trans-butenedioic acid). 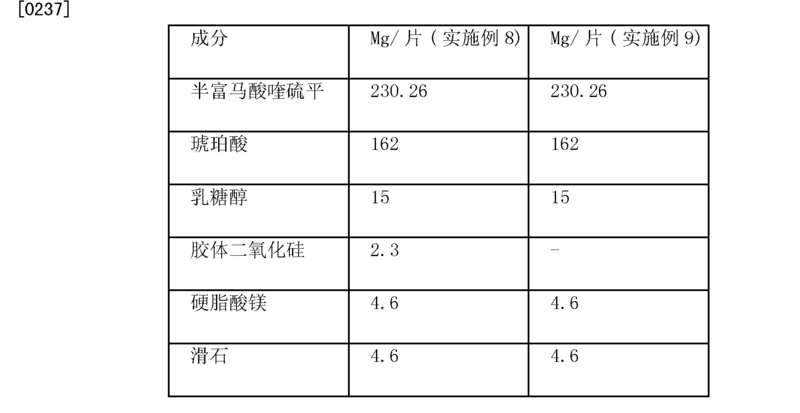 默克索引指出0.63克富马酸在25。 The Merck Index pointed out that 0.63 g of fumaric acid in 25. 。 . 在100克水中可溶。 Soluble in 100 g of water. 富马酸已被用作增味剂和PH控制剂。 Fumaric acid has been used as a flavor enhancer and PH control agents. 当在25°C制备和测定以重量体积百分比计I %水溶液或混悬液时，依据本发明的组合物应显示PH在5以下，优选在4以下。  When prepared and measured at 25 ° C in a weight percentage I% by volume aqueous solution or suspension, the composition according to the present invention should show PH 5 or less, preferably 4 or less. 在本发明的一个具体实施方案中，当在25°C制备和测定所述组合物以重量体积百分比计1%水溶液或混悬液时，所述组合物应显示PH在2至5之间，优选在2.5至4.5之间，最优选在3至4之间。 In one particular embodiment of the invention, when prepared at 25 ° C and measuring the composition by weight percentage of 1% by volume aqueous solution or suspension, the composition should show in PH between 2 and 5, preferably between 2.5 to 4.5, most preferably between 3-4. 本发明的具体实施方案可以含有为所述组合物大约5至大约95重量％，优选大约10至大约90重量％，最优选大约15至大约85重量％的琥珀酸、富马酸或琥珀酸和富马酸的混合物。  In particular embodiments of the invention the composition may contain from about 5 to about 95 wt%, preferably from about 10 to about 90 wt%, most preferably from about 15 to about 85% by weight of succinic acid, fumaric acid, or the mixture of succinic acid and fumaric acid. 在本发明的某些具体实施方案中，例如固体口服剂型，当在25°C制备和测定所述剂型成分以重量体积百分比计1%水溶液或混悬液时，所述固体口服剂型应显示PH在2至5之间，优选在2.5至4.5之间，最优选在3至4之间。  In certain embodiments of the invention, a solid oral dosage form e.g., 25 ° C when preparing and measuring the volume percent of the dosage form components to 1% by weight aqueous solution or suspension, the solid oral dosage form PH should appear between 2-5, preferably between 2.5 to 4.5, most preferably between 3-4. 这些固体口服剂型代表性的含有至少大约5重量％的选自琥珀酸、富马酸或其混合物的有机酸，优选至少大约10重量％，最优选至少大约15重量％。 These organic acid selected from succinic acid solid oral dosage form typically contains at least about 5% by weight, fumaric acid or mixtures thereof, preferably at least about 10% by weight, most preferably at least about 15% by weight. 在某些依据本发明制备的控释剂型中，已发现琥珀酸、富马酸或琥珀酸和富马酸的混合物应为所述控释剂型总重量的至少20重量％，优选至少25重量％，最优选至少27.5重量％。 In certain controlled release dosage forms prepared in accordance with the present invention, it has been found that succinic acid, fumaric acid, succinic acid and fumaric acid or a mixture should be at least 20 by weight of the total weight of the controlled release dosage form%, preferably at least 25 wt% most preferably at least 27.5% by weight. 在依据本发明制备的药物组合物中非典型抗精神病药物和有机酸的比例应当为大约5:1至1: 5，优选大约3:1至1: 3，该比例取决于选择的非典型抗精神病药物。  In the pharmaceutical compositions of the present invention is prepared atypical antipsychotic drug and an organic acid ratio should be about 5: 3 to select, depending on the ratio: 1 to 1: 5, preferably from about 3: 1 to 1 atypical antipsychotics. 本发明还应包括至少一种附加的药学上可接受的赋形剂。  The present invention also includes use of at least one additional pharmaceutically acceptable excipient. 用于本发明的药学上可接受的赋形剂可选自填充剂、粘合剂、润滑剂、助流剂、抗粘着剂、调味剂、着色剂、崩解剂或其混合物。 Pharmaceutically acceptable excipients used in the present invention may be selected from fillers, binders, lubricants, glidants, anti-sticking agents, flavoring agents, coloring agents, disintegrating agents or mixtures thereof. 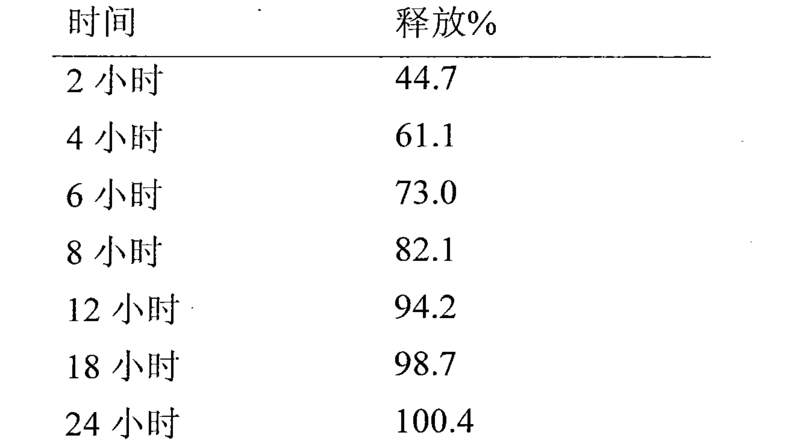 在Rowe 等人，Handbook of Pharmaceutically Acceptable Excipients (第4版2003)或美国药典29中可以发现可以用于本发明的可接受的药物赋形剂的更详细的描述，这两篇文献以引用方式并入本文。 In Rowe et al., Handbook of Pharmaceutically Acceptable Excipients (4th Ed. 2003), or it may be found in U.S. Pharmacopeia 29 A more detailed description may be used in a pharmaceutical acceptable excipient of the present invention, both of which by reference and incorporated herein. 可接受的填充剂的例子(有时被称为稀释剂)包括水；糖例如乳糖、右旋糖、蔗糖、麦芽糖，或微晶纤维素；粘土和其混合物。 Examples  acceptable fillers (sometimes referred to as a diluent) include water; sugars such as lactose, dextrose, sucrose, maltose, or microcrystalline cellulose; clays and mixtures thereof. 用于本发明的粘合剂包括具有粘合性的药学上可接受的物质。  The adhesive used in the present invention includes a pharmaceutically acceptable material adhesion. 一些例子包括纤维素，例如羟丙基甲基纤维素、羟丙基纤维素和羧甲基纤维素钠；聚乙烯吡咯烷酮；糖；淀粉和其混合物。 Some examples include cellulose, such as hydroxypropyl methylcellulose, hydroxypropyl cellulose and sodium carboxymethyl cellulose; polyvinylpyrrolidone; sugars; starch, and mixtures thereof. 可用于本发明的润滑剂、助流剂和/或抗粘着剂的例子包括滑石、硬脂酸镁、硬脂酸钙、硬脂酸、氢化植物油、聚乙二醇、二氧化硅和其混合物。  The lubricant can be used in the present invention, examples of glidants and / or anti-sticking agents include talc, magnesium stearate, calcium stearate, stearic acid, hydrogenated vegetable oils, polyethylene glycol, silica and mixtures thereof. 可用于本发明的调味剂包括欧薄荷(peppermint)、绿薄荷、冬青油、肉桂、椰子、咖啡、巧克力、香草、薄荷脑、甘草(Iiquirice)、茴香、杏、焦糖、菠萝、草莓、覆盆子、葡萄、樱桃、混合的衆果、热带水果、薄荷(mint)和其混合物。  The flavor can be used in the present invention include peppermint (Peppermint), spearmint, wintergreen, cinnamon, coconut, coffee, chocolate, vanilla, menthol, licorice (Iiquirice), anise, apricot, caramel, pineapple, strawberry, raspberry, grape, cherry, mix all the fruit, tropical fruit, mint (mint), and mixtures thereof. 可用于本发明的着色剂包括FD&C-型染料和色淀、水果和蔬菜提取物、二氧化钛和其混合物。  The colorants useful in the present invention include FD & C- type dyes and lakes, fruit and vegetable extracts, titanium dioxide and mixtures thereof. 可用于本发明的崩解剂的例子包括玉米淀粉、交联羧甲基纤维素钠、交联聚维酮(polyplasdone XL-10)、羧基乙酸淀粉钠(EXPL0TAB或PRM0JEL)或上述的任意组合。  Examples of disintegrating agents may present invention include corn starch, cross-linked sodium carboxymethylcellulose, cross-linked povidone (polyplasdone XL-10), sodium starch glycolate (EXPL0TAB or PRM0JEL) or above random combination. 本发明的药物组合物可以是药物领域已知的任何类型的组合物，例如溶液、混悬液、乳剂或固体。 The pharmaceutical composition of  the present invention may be any known in the pharmaceutical art types of compositions, such as solutions, suspensions, emulsions, or solid. 所述组合物可以是在剂型生产中使用的中间体或者可以是设计用于亲本的(parental)、静脉内的、眼睛的、口服的、颊的、直肠的或阴道的递送的剂型。 The composition may be used in the dosage form is an intermediate in the production or may be designed for the parent (Parental),, eye, oral, rectal or vaginal delivery of intravenous buccal dosage forms. 本发明优选的具体实施方案为固体口服剂型，例如口服崩解片剂、速释剂型、缓释或肠包衣剂型、控释剂型或上述的组合。 Particularly preferred embodiments of the present invention embodiment is a solid oral dosage form, for example orally disintegrating tablets, immediate release dosage form, or a combination of sustained or enteric coated dosage forms, controlled release dosage form as described above. 通过本领域公知的技术可以制备依据本发明的速释剂型，该速释剂型可以是片剂或胶囊的形式。  The immediate release dosage form may be prepared according to the present invention by techniques known in the art, the dosage may be in the form of immediate release tablets or capsules. 在形成依据本发明的速释片剂中，通过使用本领域已知的标准技术，例如共混、缓涌和/或制粒，将非典型抗精神病药物，选自琥珀酸、富马酸或其混合物的有机酸和至少一种附加的赋形剂，例如粘合剂、填充剂和润滑剂混合在一起。  In forming immediate release tablets according to the present invention, by using standard techniques known in the art, such as blending, Chung slow and / or granulation, the atypical antipsychotic, selected from succinic acid, Rich Ma organic acid or mixtures thereof and at least one additional excipient such mixed binder, a filler and a lubricant. 通过使用本领域常规使用的技术可以将混合物压制成片剂。 The mixture may be compressed into tablets using techniques conventionally used in the art. 一旦将混合物压制和形成片剂核心(core)，可以任选地用密封包衣或美观包衣进行包衣。 Once the mixture is compressed to form tablets and the core (core), it can optionally be coated with a seal coating or aesthetic coating. 代表性地，密封包衣或美观包衣为可溶于或快速崩解于水中的涂层或层，且不实质影响活性成分从片剂核心中的释放。 Typically, the seal coating is a coating or aesthetic soluble or in water rapidly disintegrating coating or layer, does not substantially affect the release of the active ingredient from the tablet cores. 最常规的密封包衣含有低分子量的羟丙基甲基纤维素或聚乙烯醇。 Most conventional seal coating comprises hydroxypropyl methylcellulose or polyvinyl alcohol, low molecular weight. 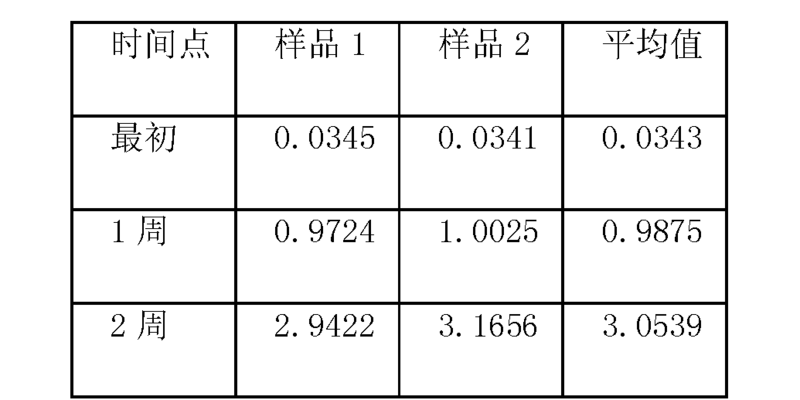 美国专利号4，786，505 ;6，099，859和5，314，697描述了一些典型的密封包衣，这些文献以引用方式并入本文。 U.S. Patent Nos. 4,786,505; 6,099,859 and 5,314,697 describe some typical seal coat, which is incorporated herein by reference. 还可以通过如下方法制备依据本发明的速释组合物:共混非典型抗精神病药物、选自琥珀酸、富马酸或其混合物的有机酸和至少一种附加的赋形剂，例如填充剂，将共混的混合物填充进明胶胶囊。  can also be prepared according to the immediate release composition of the invention by the following method: blend atypical antipsychotic, selected from succinic acid, fumaric acid or mixtures thereof and at least one additional excipient, fillers, for example, the blended mixture filled into gelatin capsules. 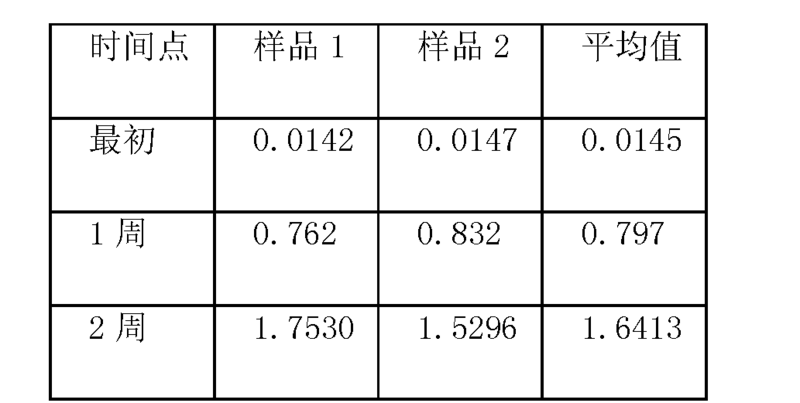 上述百分比是基于所述组合物的总重量。  The above percentages are based on total weight of the composition. 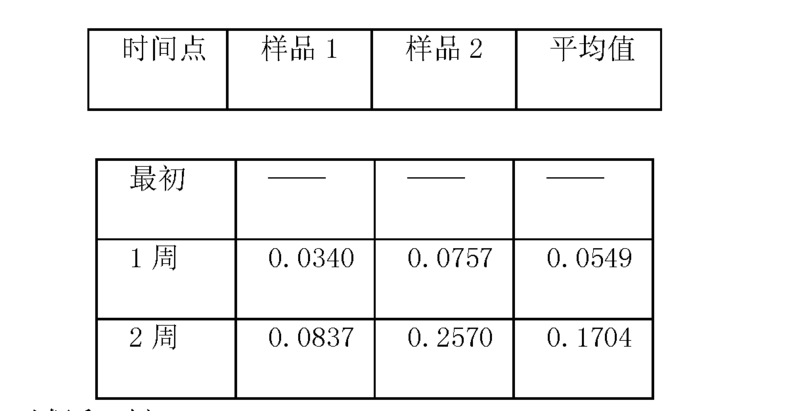 上述组合物可以进一步制成例如片剂或胶囊的剂型。 The above-described composition may further be made of dosage forms such as tablets or capsules. 还可以通过本领域公知的技术制备依据本发明的控释剂型。  The controlled release dosage form according to the present invention can also be prepared by well-known in the art. 一些用于本发明的控释剂型包括，但不限于，骨架片剂、渗透片剂、小球(pellet)填充的胶囊或前述的组合。 Some controlled release formulations used in the present invention include, but are not limited to, matrix tablets, osmotic tablets, pellets (a pellet) or a combination of the foregoing filled capsules. 释放控制赋形剂(例如亲水或疏水骨架聚合物)和聚合包衣是本领域已知的，并描述在Rowe等人，Handbookof Pharmaceutically Acceptable Excipients (第4 版2003)中，该文献以引用方式并入本文。 Release controlling excipient (e.g. hydrophilic or hydrophobic polymer backbone) and polymeric coatings are known in the art, and are described in Rowe et al., Handbookof Pharmaceutically Acceptable Excipients (4th Ed. 2003), incorporated by reference incorporated herein. 依据本发明的控释剂型应在4-24小时，优选8-24小时释放治疗有效量的非典型抗精神病药物，因此所述剂型可以每天给药一次或两次。 Controlled release dosage form according to the present invention shall be 4-24 hours, preferably 8-24 hours release a therapeutically effective amount of the atypical antipsychotics, thus the dosage form can be administered once or twice daily. 依据本发明的控释剂型的一个具体实施方案为骨架片剂。  According to one particular embodiment of the controlled release dosage form of the present invention is a matrix tablet. 所述骨架片剂应含有治疗有效量的非典型抗精神病药物，稳定量的选自琥珀酸、富马酸或其混合物的有机酸和骨架形成剂。 The matrix tablet should contain an organic acid and a matrix forming agent a therapeutically effective amount of the atypical antipsychotic, selected from stabilizing amount of succinic acid, fumaric acid or mixtures thereof. 所述骨架形成剂可以是例如蜡的疏水材料，例如水凝胶聚合物的亲水材料或二者的组合。 The matrix forming agent may be a hydrophobic material such as a wax, such as a combination of both a hydrophilic material or a hydrogel polymer. 如本文所用，水凝胶聚合物为当置于含水环境时胶化或膨胀的聚合物。 As used herein, the hydrogel polymer is a polymer gel or when inflated is placed in an aqueous environment. 通过药物从骨架扩散，骨架的侵蚀或扩散和侵蚀的组合，骨架形成剂将控制非典型抗精神病药物的释放。 Through drug diffusion from the framework, erosion or a combination of diffusion and erosion skeleton, controlled-release matrix forming agent atypical antipsychotics. 扩散和侵蚀的量取决于用于骨架形成而选择的材料。 The amount of diffusion and erosion depends on the materials used to form the backbone selected. 水凝胶形成聚合物的例子包括羟丙基甲基纤维素、羧甲基纤维素钙、羧甲基纤维素钠、瓜尔豆胶、羟乙基纤维素、羟丙基纤维素、甲基纤维素、丙烯酸聚合物和共聚物、海藻酸钠、聚氧化乙烯和其混合物。 Examples  The hydrogel-forming polymers include hydroxypropyl methyl cellulose, carboxymethyl cellulose calcium, sodium carboxymethyl cellulose, guar gum, hydroxyethyl cellulose, hydroxypropyl cellulose , methyl cellulose, acrylic polymers and copolymers, sodium alginate, polyethylene oxide and mixtures thereof. 可以用于形成非胶化或非膨胀的控释骨架(用于非典型抗精神病药物)的疏水材料的例子包括蜂蜡、白蜡、乳化蜡、氢化植物油、氢化蓖麻油、微晶蜡、鲸蜡醇、硬脂醇、例如硬脂酸的游离蜡酸、蜡酸酯、单硬脂酸丙二醇酯、单硬脂酸甘油酯、巴西棕榈腊、棕榈腊、小烛树腊、褐煤腊、地腊(ozokerite)、地腊(ceresin wax)、拉德森尼(Iardaceine)、中国蜡和其混合物。 Examples of gelling may be used to form the non-expandable controlled release matrix or hydrophobic materials (for atypical antipsychotic drug) include beeswax, white wax, emulsifying wax, hydrogenated vegetable oil, hydrogenated castor oil, microcrystalline wax, cetyl alcohol , stearyl alcohol, stearic acid, for example, the free wax acids, wax acid esters, propylene glycol monostearate, glycerol monostearate, carnauba wax, palm wax, candelilla wax, montan wax, earth wax ( ozokerite), the wax (ceresin wax), de Sunnyvale (Iardaceine), Chinese wax, and mixtures thereof. 其他可能用于本发明的速率控制赋形剂包括具有25至31碳原子的饱和烃、具有25至31碳原子的饱和醇、具有25至31碳原子的饱和单羧酸、从所述醇和单羧酸中得到的酯(在美国专利号6，923，984中描述，该文献以引用方式并入本文)。 Other rates may be used in the present invention for controlling excipients include saturated hydrocarbons having 25 to 31 carbon atoms, saturated alcohols having 25 to 31 carbon atoms, saturated monocarboxylic acids having 25 to 31 carbon atoms, alcohols from the single carboxylic ester obtained (in U.S. Patent No. 6,923,984 is described, which is incorporated herein by reference). 疏水和亲水材料的组合还可以用于制备本发明控释的骨架。  The combination of hydrophobic and hydrophilic materials may also be used in making a controlled release of the skeleton of the present invention. 依据本发明的控释骨架可以进一步含有改善工艺或调节释放性质的常规赋形剂。  The controlled-release matrix according to the present invention may further contain conventional excipients to improve the process or modified release properties. 这些常规赋形剂的例子包括前面所述的填充剂、助流剂和润滑剂。 Examples of such excipients include conventional fillers, glidants and lubricants previously described. 上面所述的疏水骨架片剂还可以含有用于所述疏水骨架片剂一个或多个表面的安慰层(placebo layer)或层。  Tablets described above may further contain hydrophobic backbone comfort layer (placebo layer) or a layer for the hydrophobic matrix tablet or a plurality of surfaces. 当疏水骨架片剂暴露于使用的环境时，安慰层用于降低所述片剂的表面积。 When the hydrophobic matrix tablet is exposed to the environment of use, comfort layer for reducing the surface area of ​​the tablet. 表面积的降低有助于控制非典型抗精神病药物从疏水骨架的释放。 Reducing the surface area to help control the release of the atypical antipsychotic drug from the hydrophobic backbone. 安慰层可以含有任何前面所述的疏水或亲水骨架材料，虽然疏水材料是优选。 Comfort layer may contain any hydrophobic or hydrophilic matrix materials previously described, although the hydrophobic material is preferred. 安慰层应覆盖所述疏水骨架片剂的表面积的大约5%至大约75%，优选大约10%至大约65%，最优选大约15%至大约50%。 Comfort layer should cover the surface area of ​​the hydrophobic matrix tablet is from about 5% to about 75%, preferably from about 10% to about 65%, most preferably from about 15% to about 50%. 一旦已经形成骨架片剂，相对于速释组合物可以任选地对其密封包衣或用如上所述的美观包衣进行包衣。  matrix tablets once it has been formed, with respect to immediate release compositions may optionally be coated or appearance thereof coated with a seal coating as described above. 含有非典型抗精神病药物的速释包衣可以直接在控释骨架核心上包衣或应用于密封包衣的控释骨架核心上。  The immediate release coating containing an atypical antipsychotic may be coated or applied on the controlled release matrix core coated directly on the sealing controlled release matrix core. 速释包衣含有非典型抗精神病药物和薄膜形成材料或粘合剂和，任选地，其他常规添加剂，例如润滑剂、填充剂和抗粘着剂。 Immediate release coating containing an atypical antipsychotic drug and a film-forming material or binder and, optionally, other conventional additives, such as lubricants, fillers and antiadherents. 通过任何常规技术，例如锅包衣和喷雾包衣，可以进行速释包衣。  by any conventional technique such as pan coating and spray coating may be an immediate release coating. 在优选的具体实施方案中，通过在含有骨架核心的锅上喷雾含水溶液或混悬液进行速释包衣。 In a preferred embodiment, a quick release coating pan by spraying the core skeleton comprises an aqueous solution or suspension. 速释包衣中应用的薄膜形成材料或粘合剂优选为水溶性或快速分散材料，例如低分子量的羟丙基甲基纤维素或聚维酮。 Immediate release coating applied in a film forming material or binder is preferably a water soluble or rapidly dispersing material, such as hydroxypropyl methylcellulose or povidone low molecular weight. 依据本发明的控释剂型的另一个具体实施方案为渗透片剂。  According to another particular embodiment of the present invention, controlled release dosage form is an osmotic tablet. 所述渗透片剂可以含有:包含治疗有效量的非典型抗精神病药物和选自琥珀酸、富马酸或其混合物的有机酸的核心；包裹所述核心的半渗透膜；和用于释放药物的半渗透膜中的通路。 The osmotic tablet may contain: a therapeutically effective amount of the atypical antipsychotic drug selected from succinic acid, fumaric acid or a mixture of organic acids of the core; wrapping the core semipermeable membrane; and means for releasing the drug the semi-permeable membrane passage. 可以用或不用胶化或膨胀聚合物制备所述渗透片剂的核心。  or may be prepared without gelling or expanding polymer core of the osmotic tablet. 所述渗透片剂的核心可以是下列成分的均匀共混:非典型抗精神病药物，选自琥珀酸、富马酸或其混合物的有机酸和如美国专利号5，654，005所述的药物赋形剂或含有如美国专利号4，612，008或4，873，337所述的药物组合物或推动组合物(push composition)的多层结构。 The core of the osmotic tablet may be a homogeneous blend of the following components: an organic acid and the drug according to U.S. 5,654,005 atypical antipsychotic, selected from succinic acid, fumaric acid or mixtures thereof Patent No. excipient or a multilayered structure as described in US 4,612,008 or 4,873,337, or a pharmaceutical composition composition No. push (push composition) of. 上面所述的专利以引用方式并入本文。 The above patents are incorporated herein by reference. 在半渗透膜应用之前可以任选将渗透核心进行密封包衣。  Before application of the semipermeable membrane may optionally be seal coated core permeate. 该半透膜应对外部液体如水或水样生物液体通道是有渗透性的，但对于渗透核心中活性成分通道是无渗透性的。 The semipermeable membrane against external liquids such as water or a biological fluid like water channels are permeable, but permeable core in the channel is not an active ingredient permeable. 用于形成半透膜的材料是乙基纤维素、纤维素酯、纤维素二酯、纤维素三酯、纤维素醚、纤维素酯醚、酰化纤维素、二酰化纤维素、三酰化纤维素、乙酸纤维素、双乙酸纤维素、三乙酸纤维素、乙酸丙酸纤维素和乙酸丁酸纤维素。 Material for forming the semipermeable membrane is ethyl cellulose, cellulose esters, cellulose diesters, cellulose triesters, cellulose ethers, cellulose ester ether, cellulose acylate, cellulose diacylate, triacyl cellulose, cellulose acetate, cellulose diacetate, cellulose triacetate, cellulose acetate propionate and cellulose acetate butyrate. 在美国专利号3，845，770 ;3，916，899 ；4，008，719 ;4，036，228和4，612，008中描述了其它合适的聚合物(这些文献以引用方式并入本文)。 In U.S. Patent Nos. 3,845,770; 3,916,899; 4,008,719; 4,036,228 and 4,612,008 are described in Other suitable polymers (which are incorporated herein by reference ). 最优选的半透膜材料是含有39.3到40.3%乙酰含量的乙酸纤维素，并且购自Eastman FineChemicals0 在可选择的具体实施方案中，半透膜可以包括上述的一种聚合物和助流剂。 The most preferred semipermeable membrane material is cellulose acetate comprising an acetyl content of 39.3 to 40.3 percent, and available from Eastman FineChemicals0  In alternative embodiments, the semipermeable membrane can include one co-polymer and flow agent. 助流剂可以通过其溶解增加吸收入核心的液体体积以使组合物通过膜中形成的通路和/或孔基本上分散所有活性成分。 Glidants may increase the volume of the liquid absorbed into the core by dissolving the composition to substantially all of the active ingredients dispersed through the passage and / or holes formed in the film. 助流剂可以是水溶材料或肠溶材料。 Glidants may be a water soluble material or an enteric material. 用作助流剂的优选材料的例子是氯化钠、氯化钾、蔗糖、山梨醇、甘露醇、聚乙二醇(PEG)、丙二醇、羟丙基纤维素、羟丙基甲基纤维素、邻苯二甲酸羟丙基甲基纤维素、邻苯二甲酸乙酸纤维素、聚乙烯醇、甲基丙烯酸共聚物、泊洛沙姆(例如可购自BASF的LUTROL F68,LUTROL F127,LUTROL F108)和其混合物。 Examples of preferred materials as glidants are sodium chloride, potassium chloride, sucrose, sorbitol, mannitol, polyethylene glycol (PEG), propylene glycol, hydroxypropyl cellulose, hydroxypropyl methyl cellulose , hydroxypropylmethyl cellulose phthalate, cellulose acetate phthalate, polyvinyl alcohols, methacrylic acid copolymers, poloxamers (e.g., commercially available from BASF LUTROL F68, LUTROL F127, LUTROL F108 ) and mixtures thereof. 优选的助流剂是PEG400。 Preferred glidant is PEG400. 助流剂为膜包衣总重量的大约0%至大约40%，最优选为膜包衣总重量的大约2 %至大约20 %。  about 0% of the total weight of the film coating glidants to about 40%, and most preferably the total weight of the film coating of about 2% to about 20%. 助流剂从半透膜溶解或过滤从而在半透膜上形成通道，其使得液体进入渗透核心并溶解非典型抗精神病药物。 Glidants or filtration is dissolved to form a passage from the semipermeable membrane semipermeable membrane such that the liquid permeation into the core and dissolve the atypical antipsychotic drug. 半透膜也可以通过使用公知的赋形剂如增塑剂形成。  The semi-permeable membrane such as a plasticizer may also be formed by a known excipients. 一些公知的增塑剂包括己二酸酯、壬二酸酯、苯甲酸酯(enzoate)、柠檬酸盐、硬脂酸酯、异布酯(isoebucate)、葵二酸酯、三乙基柠檬酸酯、三正丁基柠檬酸酯、乙酰三正丁基柠檬酸酯、柠檬酸酯和在JohnWiley&Sons 出版的Encyclopedia of Polymer Science and Technology, Vol.10(1969)中所述那些。 Some known plasticizers include adipate, azelate, benzoate (enzoate), citrate, stearate, isobutyl ester cloth (isoebucate), sebacic acid esters, triethyl lemons acetate, n-butyl citrate, acetyl tri-n-butyl citrate, citric acid esters, and published by JohnWiley & Sons in Encyclopedia of Polymer Science and Technology, Vol.10 (1969) as those in the. 优选的增塑剂是甘油三乙酸乙酸酯，乙酰化单酸甘油酯、葡萄籽油、橄榄油、芝麻油、乙酰柠檬酸三丁酯、乙酰柠檬酸三乙酯、甘油山梨醇、草酸二乙酯、马来酸二乙酯、富马酸二乙酯、琥珀酸二丁酯，丙二酸二乙酯、邻苯二甲酸二辛酯、壬二酸二丁酯、柠檬酸三乙酯、柠檬酸三丁酯、甘油三丁酸酯和其组合。 Preferred plasticizers are glycerol triacetate acetate, tributyl acetylated monoglyceride, grape seed oil, olive oil, sesame oil, acetyl tributyl citrate, acetyl triethyl citrate, glycerin sorbitol, diethyl oxalate esters, diethyl maleate, diethyl fumarate, dibutyl succinate, diethyl malonate, dioctyl phthalate, diisooctyl azelate ester, triethyl citrate, tributyl citrate, tributyrin, and combinations thereof. 根据特定的增塑剂，可以使用根据膜包衣总重量大约0%至大约25%，优选大约2%至大约15%的增塑剂。 According to a particular plasticizer, may be used according to the total weight of the film coating about 0% to about 25%, preferably from about 2% to about 15% plasticizer. 一般来说，包裹核的膜包衣将包含核心和包衣总重量的大约1%至大约5%，优选大约2%至大约3%。  Generally, the film coating encapsulating the core comprising a core and a coating weight of the total from about 1% to about 5%, preferably from about 2% to about 3%. 在优选的具体实施方案中，包裹核心的膜包衣进一步包含允许药物从核心控制释放的通路。  In a preferred embodiment, the core wrap further comprising a film coating allows the release of drug from the core of the control passage. 如本文所用，术语“通路”包括孔隙、孔口、孔腔、孔穴、稀薄区或易蚀成份例如凝胶栓，其侵蚀形成从剂型中释放活性成分的渗透通路。 As used herein, the term "passageway" includes aperture, orifice, bore, hole, or a thin region erodible suppository composition such as a gel, which is formed by erosion release of the active ingredient from the dosage form percolation pathways. 依据本发明主题所用的通路是众所周知的，并在美国专利号3，`845，770 ;3，916，899 ;4，034，758 ;4，077，407 ;4，783，337 和5，071，607被描述，这些文献以引用方式并入本文。 The subject of the invention is based on the path used are well known, and in U.S. Patent No. 3, '845,770; 3,916,899; 4,034,758; 4,077,407; 4,783,337 and 5,071 , 607 is described, which is incorporated herein by reference. 可以将速释包衣应用到半透膜中。  The immediate release coating may be applied to the semipermeable membrane. 速释包衣如上所述，并且可以被，但不限于，选自药物分层、层压或干压制的工艺应用。 Immediate release coating as described above, and may be, but is not limited to, a selected drug layered, laminated or pressed dry process applications. 在优选的具体实施方案中，在应用速释层前，将密封包衣应用至半渗透膜。 In a preferred embodiment, the immediate release layer prior to application of the seal coat applied to the semipermeable membrane. 依据本发明的控释剂型的另一个具体实施方案包括含有活性成分的小珠、小球或小片(min1-tablet)。  According to another particular embodiment of the controlled release dosage form of the present invention containing the active ingredient comprises beads, pellets or small pieces (min1-tablet). 可以将所述小珠、小球或小片填充进硬或软明胶胶囊或压制成片剂。 The beads may be, pellets or mini-tablets filled into hard or soft gelatin capsules or compressed into tablets. 通过本领域公知的方法制备所述小珠、小球或小片，代表性地其大小范围为直径大约0.1mm至大约3mm。  The beads are prepared by methods known in the art, pellets or chips, which typically range in size from a diameter of about 0.1mm to about 3mm. 理想地,所述小珠或小球为直径大约0.2至大约1mm，所述小片为直径大约0.5至大约2.5mm。 Desirably, the beads or pellets having a diameter of about 0.2 to about 1mm, the die having a diameter from about 0.5 to about 2.5mm. 通过将依据本发明的组合物在惰性基质(例如以商品名CELPHERE®市售的彩色糖豆籽(non-pariel seed)或微晶纤维素籽)上成层制备活性或速释小珠或小球。  By the composition according to the present invention in an inert matrix (e.g., commercially available under the trade name CELPHERE® colored jelly beans seeds (non-pariel seed) or microcrystalline cellulose seeds) into the active layer or immediate release preparation beads or pellets. 也可以通过制备依据本发明的组合物，并使用挤出滚圆技术处理所述组合物制备活性小珠或小球。 Can also be prepared according to the composition of the invention, the use of extrusion spheronization techniques and treatment of the composition for preparing the active beads or pellets. 所述组合物应含有非典型抗精神病药物、选自琥珀酸、富马酸或其混合物的有机酸和至少一种附加的常规药物赋形剂(例如粘合剂和/或填充剂)的混合物。 The composition should contain an atypical antipsychotic, selected from a mixture of succinic acid, fumaric acid or mixtures thereof and at least one additional conventional pharmaceutical excipients (e.g., binders and / or fillers) of . 也可以将活性成分和常规药物赋形剂的混合物压制成小片。 Mixtures of conventional pharmaceutical excipients and the active ingredient can be compressed into small pieces. 也可以通过美国专利号5，529，791和4, 984, 240 (以引用方式并入本文)中所述的方法制备活性或速释小珠或小球。 Can also U.S. Patent Nos. 5,529,791 and 4, 984, 240 (herein incorporated by reference) activity or prepared according to methods speed release beads or pellets. 一旦制成活性或速释小珠、小球或小片，可以用释放控制聚合物包衣对其进行包衣。  Once made active or immediate release beads, pellets or chips, can be coated with a release controlling polymer coating them. 所述控释包衣应含有水不溶的、水可渗透聚合物和，任选地，水或酸溶通道剂(channeling agent)。 The controlled release coating should contain a water-insoluble, water-permeable polymer and, optionally, water or acid soluble agent channel (channeling agent). 所述控释包衣也可以含有润滑剂或隔离剂和,任选地,表面活性剂。 The controlled release coating may also contain a lubricant or release agent and, optionally, a surfactant. 合适的水不溶的、水可渗透聚合物为乙基纤维素、乙酸纤维素和聚丙烯酸酯或其混合物。  Suitable water-insoluble, water-permeable polymer is ethylcellulose, cellulose acetate and polyacrylate or mixtures thereof. 美国专利号5，002, 776描述了其他水不溶聚合物，该文献以引用方式并入本文。 U.S. Patent No. 5,002, 776 describe other water-insoluble polymers, which are incorporated herein by reference. 本发明控释小珠、小球或小片剂型的一个具体实施方案应用水不溶的、水可渗透聚合物包衣，例如聚甲基丙烯酸酯共聚物，优选聚(丙烯酸乙酸酯甲基丙烯酸甲酯)共聚物，其以商品名EUDRAGIT NE 30D 购自Rohm Pharma。  The controlled release beads of the present invention, a specific embodiment of the pellets or tablets of the type of application of water-insoluble, water-permeable polymer coating, e.g. polymethacrylate copolymers, preferably poly (acrylic acid ester methyl methacrylate) copolymer, under the trade name EUDRAGIT NE 30D commercially available from Rohm Pharma. 可以任选地用于小珠、小球或小片的控释包衣的合适的表面活性剂为十二醇硫酸钠、牛磺胆酸钠或聚山梨醇酯。  Suitable surfactants may optionally be used in the controlled release coating beads, pellets or small pieces of sodium lauryl sulfate, sodium taurocholate or polysorbate. 通过本领域公知的任何技术，例如旋转制粒机、锅包衣机或流化床包衣机，可以将控释包衣应用至活性小珠、小球或小片。  by any technique known in the art, such as a rotary granulator, pan coater or a fluidized bed coater, the controlled release coating may be applied to the active beads, pellets or chips. 在本发明的一个具体实施方案中，制备活性或速释小珠、小球或小片，其含有非典型抗精神病药物和选自琥珀酸、富马酸或其混合物的有机酸。  In one particular embodiment of the invention, the preparation of the active or immediate release beads, pellets or chips, comprising the atypical antipsychotic drug and an organic acid selected from succinic acid, fumaric acid or mixtures thereof. 随后，部分的活性或速释小珠、小球或小片用控释包衣进行包衣。 Subsequently, the active moiety or immediate release beads, pellets or small tablets coated with a controlled release coating. 将各种活性和控释包衣的小珠、小球或小片混合物进行共混，并且充填入硬明胶胶囊。 The various active and the controlled release coating of beads, pellets or chips mixture is blended and filled into hard gelatin capsules. 例如，将20%活性小珠和80%控释小珠的混合物填充入硬明胶胶囊以制备依据本发明的每天一次的胶囊剂型。 For example, a mixture of 20% active and 80% controlled release beads is beads filled into hard gelatin capsules to prepare a capsule dosage form once a day based on the present invention. 也可以通过首先制备如上所述的速释片剂核心、控释骨架核心或活性小珠、小球或小片制备依据本发明的缓释剂型。  may be, controlled-release matrix core or active beads, pellets or mini-tablets prepared according to the present invention by sustained release dosage form immediate release tablet core is first prepared as described above. 然后用肠溶或PH敏感包衣通过本领域公知技术将所述核心进行包衣。 PH-sensitive or enteric then coated by techniques known in the art for coating the core. 用于制备缓释包衣的肠溶或pH依赖包衣材料包括玉米蛋白、虫胶、甲基丙烯酸共聚物、邻苯二甲酸乙酸纤维素、邻苯二甲酸羟丙基甲基纤维素、琥珀酸乙酸羟丙基甲基纤维素、偏苯三酸乙酸纤维素、聚乙酸乙烯邻苯二甲酸酯或其混合物。 An enteric or pH  for preparing a sustained release coating comprises a coating material dependent zein, shellac, methacrylic acid copolymers, cellulose acetate phthalate, hydroxypropyl methylcellulose phthalate, Su, hydroxypropyl methyl cellulose acetate succinate, cellulose acetate trimellitate, polyvinyl acetate phthalate or mixtures thereof. 应当使用缓释包衣，以便核心中的非典型抗精神病药物仅能在组合物已通过胃后才释放。  The release coating should be used, so that the core atypical antipsychotics released only after the composition passes through the stomach. 为了确保核心中的非典型抗精神病药物直到组合物已离开胃才释放，应当设计缓释包衣溶解在pH 4.5以上，优选5.5以上，最优选pH 6以上。 To ensure that the core of the atypical antipsychotic drug is not released until the composition has left the stomach, the release coating should be designed to dissolve at pH 4.5 or more, more preferably 5.5, most preferably pH 6 or more. 所述缓释包衣也可以含有如上所述增塑剂和其他常规加工助剂。 The  As described above release coating may also contain plasticizers and other conventional processing aids. 依据本发明的缓释剂型也可以含有速释成分。  The sustained release dosage form according to the present invention may contain an immediate release component. 例如，在缓释片剂的情况下，可以用如前所述的速释层将肠溶或PH依赖包衣片剂进行包衣。 For example, in the case of sustained-release tablet, an immediate release layer may be used as previously described or PH dependent enteric coated tablets may be coated. 在肠溶包衣小球情况下，可以将肠溶包衣小球和速释小球混合物一起共混，并且填充入硬明胶胶囊或压制成片剂。 In the enteric coated pellets, the enteric coating may be blended with a mixture of pellets and immediate release pellets and filled into hard gelatin capsules or compressed into tablets. 肠溶或pH包衣的组合物和速释成分的组合将允许非典型抗精神病药物从单一剂型的脉冲递送(pulsatile delivery)。 Or a combination of an enteric coated composition pH and immediate release component will allow delivery of the atypical antipsychotic (pulsatile delivery) pulse from a single dosage form. 当将依据本发明制备的药物组合物和剂型置于敞开容器中并且暴露于60%相对湿度和60°C两周时，所述药物组合物和剂型应当含有基于所述组合物或剂型总重量的0.5重量％以下的总活性成分杂质，优选0.3重量％以下，最优选0.25重量％以下的总活性成分杂质。  When the pharmaceutical compositions and dosage forms of the present invention is prepared and placed in an open vessel exposed to 60% relative humidity and 60 ° C during two weeks, the pharmaceutical compositions and dosage forms should contain the composition or on 0.5% by weight of the total weight of the dosage form of the active ingredient or less of total impurities, preferably 0.3 wt% or less, most preferably 0.25 wt% or less of the total active impurities. 以下仅提供示例，并没有试图限制本发明。  The following provides an example only, and is not intended to limit the present invention. 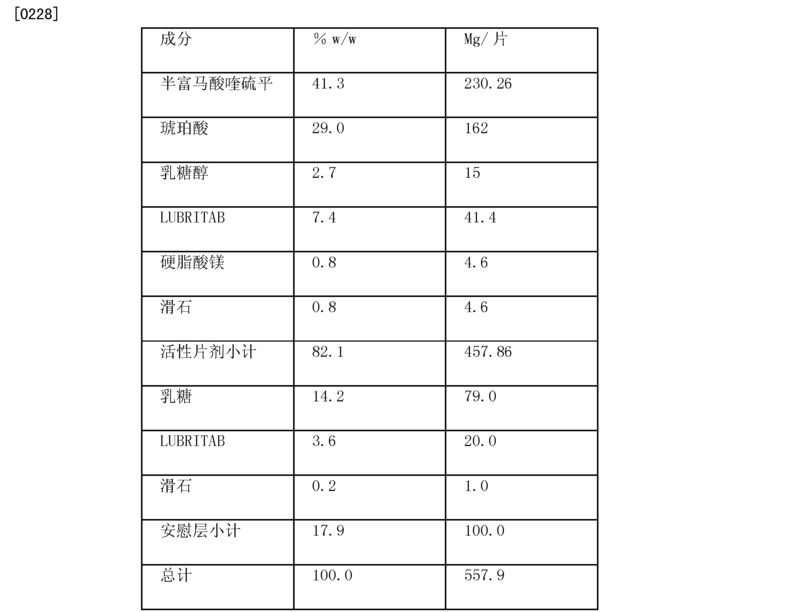 将大约75克Lactitol NF (乳糖醇)溶解于大约145克纯化水中以制备Lactitol溶液。  Approximately 75 g of NF Lactitol (lactitol) were dissolved in about 145 g of purified water to prepare Lactitol solution. 将已通过120目筛过滤的大约1151.3克半富马酸喹硫平和已通过80目筛过滤的大约810.0克琥珀酸混合大约5分钟。  which has been filtered through a 120 mesh sieve of about 1151.3 g Quetiapine hemifumarate is mixed for about 5 minutes to about 810.0 g of succinic acid through an 80 mesh screen filtration. 然后用200mlLaCtitol溶液喷雾混合物以生成颗粒。 Then the mixture to form particles with a 200mlLaCtitol solution is sprayed. 干燥颗粒并分大小，20目以下的颗粒被丢弃。 Particle size fraction and dried, particles below 20 mesh are discarded. 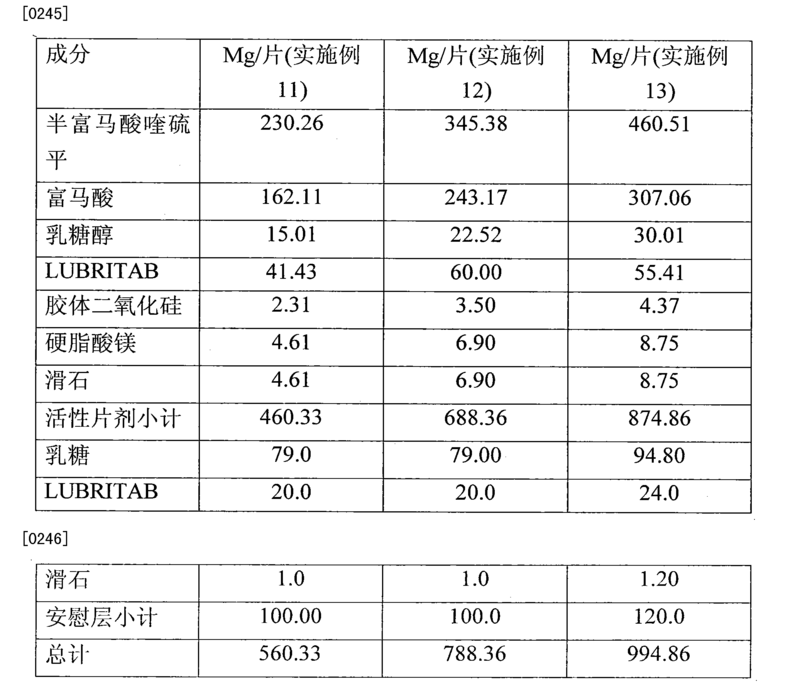 然后将大约203.63克干燥的和分过大小的颗粒与大约20.7克LUBRITAB (氢化植物油)，2.3克滑石和1.15克胶体二氧化硅在V型搅拌机中共混大约15分钟。  Approximately 203.63 grams was then dried and divided over the particle size and about 20.7 g LUBRITAB (hydrogenated vegetable oil), 2.3 g of talc and 1.15 g of colloidal silica were blended in a V-blender for about 15 minutes. 将大约2.3克硬脂酸镁加至混合物中，进一步共混大约5分钟。 Approximately 2.3 g of magnesium stearate was added to the mixture and further blended for about 5 minutes. 然后使用带有8*16mm胶囊型冲模的旋转压片机，将混合物压制成控释的喹硫平片剂。  using a rotary tableting machine with the capsule 8 * 16mm punch, and the mixture was pressed into tablets for controlled release of quetiapine. 随后，使用旋转压片机将安慰速率控制层压制在所述控释喹硫平片剂的一面上。  Then, using a rotary tableting machine comfort rate controlling layer in one side of the press release quetiapine tablets. 通过在V型搅拌机中混合大约39.5克lactose NF, 10克LUBRITAB和0.5克滑石得到的颗粒制备安慰速率控制层。 By mixing about 39.5 grams lactose NF in a V-blender to prepare a rate of 10 g LUBRITAB comfort particles and 0.5 g of talc to obtain the control layer. 悬液的pH为3.46。 The suspension pH was 3.46. 根据实施例3所述的操作测定在实施例6和7制备的片剂的pH。  In tablets prepared in Example 6 pH 7 and the operation of the embodiment according to Example 3 was measured. 实施例6的I %混悬液的pH为3.65，实施例6的5%混悬液的pH为3.46。 Example I 6% pH of the suspension was 3.65, pH of 5% Example 6 of the suspension was 3.46. 实施例7的I %混悬液的pH为3.67，实施例7的5%混悬液的pH为3.5。 I Example 7 3.67% pH of the suspension, a suspension of 5% pH of 7 Example 3.5. 尽管为了揭示本发明提出了一些优选或可选的本发明的具体实施方案，但本领域技术人员可对公开的具体实施方案进行修改。  Although the present invention proposes to reveal the specific embodiment of some preferred or alternative embodiments of the present invention, those skilled in the art can modify the disclosed specific embodiments. 因此，附加的权利要求书涵盖所有本发明的具体实施方案以及对具体实施方案在不偏离本发明的实质与范围情况下的修改。 Accordingly, the appended claims to cover all particular embodiments of the invention and the specific embodiments without departing from the spirit and scope of the modifications of the present invention. 1.一种固体口服控释剂型，其含有(i)以剂型重量计35%至65%的富马酸喹硫平(ii)以剂型重量计20%至60%的琥珀酸；和(iii)至少一种药学上可接受的赋形剂的混合物，其中以重量体积百分比计，1%所述剂型在纯净水中的溶液或混悬液的PH为3-4。 1. A solid oral controlled release dosage form, comprising (i) a dosage form by weight of 35-65% of the quetiapine fumarate (ii) in a dosage form 20% by weight to 60% succinic acid; and (iii ) a mixture of at least one pharmaceutically acceptable excipient, wherein the percentage in weight by volume, the dosage form PH 1% solution or suspension of purified water was 3-4. 2.根据权利要求1所述的剂型，其中所述固体口服控释剂型为疏水骨架，所述疏水骨架不含任何胶化或膨胀的材料。 2. The dosage form according to claim 1, wherein the solid oral controlled release dosage form to a hydrophobic backbone, the hydrophobic backbone does not contain any gelling or expandable material. 3.一种口服固体控释剂型，其含有下述a、b和c的混合物: a、以剂型重量计35%至65%的富马酸喹硫平； b、以剂型重量计20%至50%的琥珀酸；和C、速率控制赋形剂， 其中以重量体积百分比计，1%所述剂型在纯净水中的溶液或混悬液的pH为3-4。 An oral solid controlled release dosage form, comprising the following a, b and c of the mixture: a, dosage form 35% by weight to 65% quetiapine fumarate; b, dosage form 20% by weight to 50% succinic acid; and C, the rate controlling excipient, wherein the percentage in weight by volume, the dosage form at a pH of 1% solution or suspension of purified water was 3-4. 4.根据权利要求3所述的固体控释剂型，其中所述剂型为骨架片剂。 4. The solid controlled release dosage form as claimed in claim 3, wherein the dosage form is a matrix tablet. 5.根据权利要求4所述的固体控释剂型，其中所述速率控制赋形剂为疏水材料。 5. The solid controlled release dosage form as claimed in claim 4, wherein the rate controlling excipient is a hydrophobic material. 6.根据权利要求4所述的固体控释剂型，其中所述速率控制赋形剂为亲水材料。 6. The solid controlled release dosage form as claimed in claim 4, wherein the rate controlling excipient is a hydrophilic material. 7.根据权利要求4所述的固体控释剂型，其中所述骨架不含任何胶化或膨胀的材料。 7. The solid controlled release dosage form as claimed in claim 4, wherein the scaffold does not contain any gelling or expandable material. 8.根据权利要求1所述的剂型，其中所述药学上可接受的赋形剂为速率控制赋形剂。 8. The dosage form according to claim 1, wherein the pharmaceutically acceptable excipient is a rate controlling excipient. 9.根据权利要求1所述的`剂型，其中所述剂型为疏水骨架片剂，所述混合物含有: (1)35-65被％的富马酸喹硫平； (^)20-50«七％的琥珀酸； (iii) 3-15wt%的疏水性速率控制赋形剂； (iv) 1-15»1:%的填充剂；和(v)0.l_10wt%的润滑剂和/或助流剂。 9. The dosage form according to claim 1 ', wherein the hydrophobic matrix tablet dosage form, the mixture comprises: (1) 35-65% of the quetiapine fumarate; (^) 20-50 « seven percent succinic acid; (iii) 3-15wt% of a hydrophobic rate controlling excipient; (iv) 1-15 »1:% filler; and (v) 0.l_10wt% of a lubricant and / or glidant. 10.根据权利要求9所述的剂型，其进一步含有被应用于所述混合物的至少一种安慰剂层，其中所述安慰剂层覆盖所述混合物的5%至75%的表面区域。 10. The dosage form according to claim 9, further comprising at least one of the placebo layer is applied to the mixture, wherein the surface area of ​​placebo layer covers 5-75% of the mixture. 11.根据权利要求10所述的剂型，其中所述安慰剂层覆盖所述混合物的10%至65%的表面区域。 11. The dosage form of claim 10, wherein the surface area of ​​placebo layer covers 10-65% of the mixture. 12.根据权利要求10所述的剂型，其中所述安慰剂层覆盖所述混合物的15%至50%的表面区域。 12. 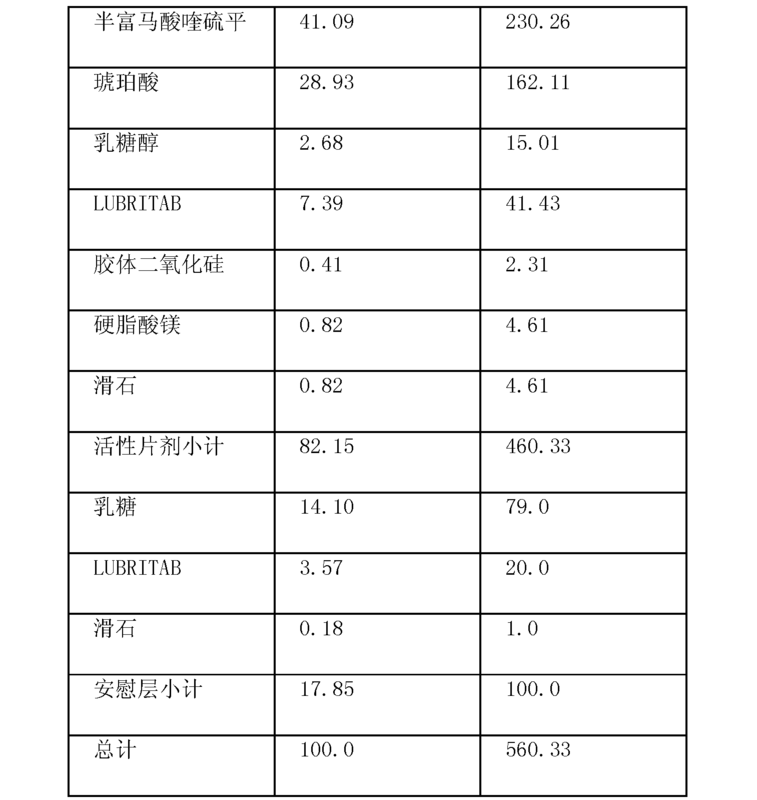 The dosage form according to claim 10, wherein the surface area of ​​placebo layer covers 15-50% of the mixture. 13.根据权利要求10所述的剂型，其中所述安慰剂层含有疏水骨架材料或亲水骨架材料。 13. A dosage form according to claim 10, wherein said placebo layer containing a hydrophobic material or a hydrophilic matrix material backbone. 14.根据权利要求10所述的剂型，其中所述安慰剂层含有疏水骨架材料。 14. The dosage form according to claim 10, wherein said layer comprising a hydrophobic matrix material placebo. ES2336913T3 (en) 2010-04-19 Modified-release tablet of bupropion hydrochloride. Owner name: HUNAN DONGTING PHARMACEUTICAL CO., LTD.